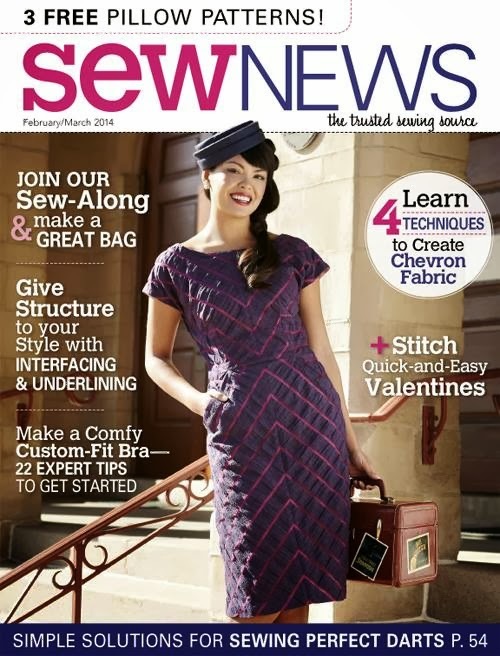 Štepalica: Two of my dresses featured in Sew News! When was the last time you were so excited that you (almost) jumped off of a chair? You know that feeling when you're overwhelmed by happiness and pride over something you did, something you had put a lot of effort into. When you go childish wanting to run across your house screaming "I did this!" That's exactly what happened to me when I saw the cover page of a new issue of Sew News magazine. It's not the first time my garments are featured on the cover, it happened with the sailor pants and the Dots Invasion dress. I can't give you some qualitative comparison of these situations, nor to tell you when I was more excited - each time it's a new experience, which fills me with pride and overwhelms emotionally. The February / March 2014 issue of the magazine has a nice surprise and a slight step out of the routine to me. 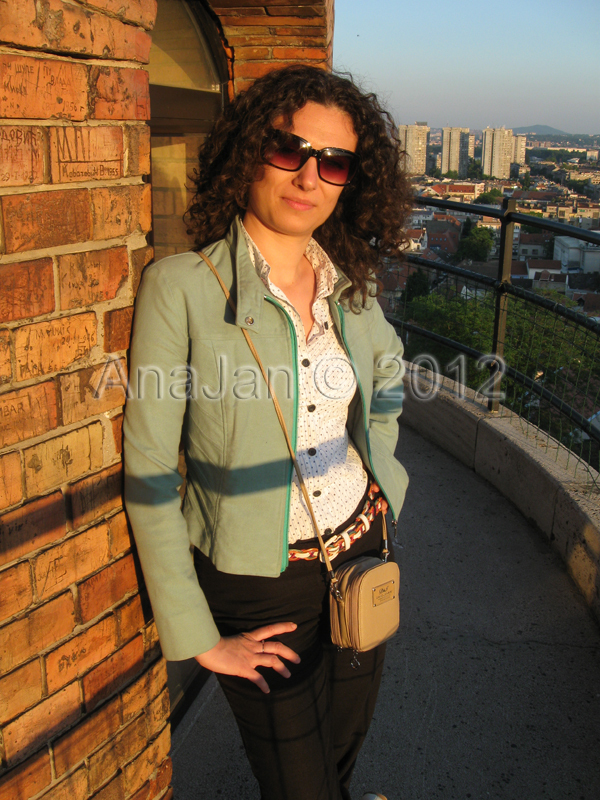 I wrote not one, but two articles about two nice dresses and few more garments that you might recognize from the blog. The cover page dress was made back in May last year, using the Burda Style pattern (disclaimer: the article says all the models are my own designs, which isn't the fact; I only interpreted commercial patterns from Burda Style and Patrones magazines), which was a great base for demonstrating a technique for sewing striped fabric into chevron. The fabric is a synthetic taffeta with transparent stripes in organza weave; the whole dress is underlined using a pale pink lining. Along with the dress, the article features my Burda vs. Patrones shirt, turquoise motor-jacket, as well as a detail from the heart shaped box integration bodice I made during the TR Masterclass. The article is generously published on the Sew News' website, and you can read it here. Along with the chevron tutorial, I wrote an article for my regular column "Pattern Play", which features a brand new strapless lace dress which I haven't posted about yet. I drafted the pattern for it myself, off course. It's a cocktail strapless dress, witch has a corsage structure. Along with the corsage layer, the dress is underlined with a powder-pink silk satin which gives the black lace a great contrast. Also, the dress is lined, which means it's constructed of four layers of fabric. The corsage has breast cups and boning structure, which hold the shape of the dress and keep the top from rolling down. The dress is shaped using vertical waist darts. The lace and silk satin were sewed as a single layer, so both layers act as one. This way, the satin hid seam allowances of the lace layer. The lace had a scalloped border, which I used as a hemline. I added a strip made of the border to the neckline, thus making the dress well balanced. I hadn't managed to snap some photos of any of the dresses before they were sent to the States for a photo-shoot, so this time you won't see any pictures of me wearing the garments. However, with such nice photos from the magazine, I think the dresses are featured the best they could have been! Draga, čestitam. To je zaista veliki uspeh, njima je bolje da redakciju presele ovde, zbog tebe!! Haha, sigurna sam da ce to blagovremeno i uciniti ;). Hvala Nego! These are really beautiful creations and it's wonderful to see them presented so nicely in the magazine. Congratulations! You have a good reason to be happy, I would be in heaven if I could create such pieces. Thanks so much Ariada! I loved the pictures this time, the model they used is so pretty and my dresses suit her perfectly. I'm glad you found the chevron topic interesting. I've been using this ornament again and again, and just love it. Congratulations! Both dresses are beautiful!!! I want to make this dress can you help me? Congratulations!! Ahhhh that lace dress is absolutely gorgeous!